If you want to purchase a small or a large kitchen appliance, you want the product to be both durable and reliable, isn’t it? 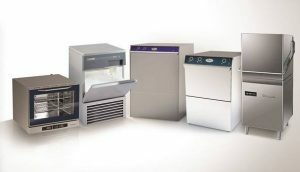 Durability and reliability are the two most important concerns for buyers considering dishwashers, refrigerators, microwaves, airfryers, toasters, coffee machines, water purifiers, cooking ranges, vents, hoods, chimneys, blenders and other expensive and bulky items. So, this is the time to get an answer for the big question- what are the best kitchen appliance brands offering top quality gadgets and tools? Which are the brands that are top rated for the performance, quality and overall use of the kitchen appliances that they offer? If you are in the look out of large kitchen appliances then Whirlpool is the brand that you must trust. It is one of the most dependable kitchen appliance brands in the market. It works excellently for all those individuals who remain bent towards the use of durable models that can be used very easily and would not break down unexpectedly right after they are bought from the market. As per market reports, Whirlpool tends to be the most trustworthy brand in that it offers affordable products and smaller models at prices that are very well suited for the budget-conscious buyers. Also, the company has the lowest reports of service calls which means that customer experience is good for all those who buy the products from this brand. The brand is also known for taking the best positions on different surveys carried out to come up with the list of the best large kitchen appliance brands. The company scores high on customer service while ensuring complete satisfaction to the customers. Majority of the users who have used the products from this brand say that one of the best things about its products is that they do not break down very easily. The products from Whirlpool generally slant towards laundry appliances while also covering the basic refrigerators and oven ranges. Their products do not always come with many bells and whistles yet they offer long-term service without any disturbance. This is exactly what is desired by majority of the homeowners. Nevertheless, for the ones who are in the look out of specifically spacious and large kitchen appliances, there are other brands that can be considered. KitchenAid is one of the most recognizable kitchen appliance brands in the industry these days. It is owned by the Whirpool Corporation along with other brands like Amana, Maytag, and Jenn-Air. The kitchen appliances available from KitchenAid are known for their aesthetically appealing exteriors and their industrial appearances. Despite the fact that this brand is very well-known for its refrigerators and dishwashers, its front control ranges deserve a special mentioned mainly because of their performance and design. The brand also manufactures ranges with full-size top ovens and warming and baking drawers underneath. There are exclusive features available in refrigeration and products with Wi-Fi capabilities like applications and compatibility. This is one kitchen gadget brand that is primarily interest in the performance, durability and traditional-style of its products. KitchenAid is one of the most interesting kitchen appliance brands specifically because it has a long history of offering solid products. It has never fallen behind the more aggressive brands or competitors entering the market of the modern times. The company has always indulged in the procedure of revamping its kitchen appliance designs and performance. At present, the brand has its focus on designing and manufacturing high-end models featuring sharp industrial appearances. It is only because of its solid presence in the industry that KitchenAid is considered one of the best kitchen appliance brands available in the present times. It produces high-end and powerful refrigerators, dishwashers and ovens. So, if you are thinking about going for serious kitchen renovation then look into the products available from KitchenAid. Their recent offerings will surely appeal to you. It is one of the best places for getting hold of kitchen appliances with fun touch screens and smart features. In the present times, Bosch Benchmark is highly recognized as one of the most luxurious kitchen appliance brands. It is known for its amazingly beautiful, affordable and high-end products. Previously, the products from Bosch spanned the value range but today the company provides appliances and gadgets that are comparable to the other luxury brands that are known for offering affordable products. One of the best things about Bosch benchmark is that it is the upper stratum of Bosch. 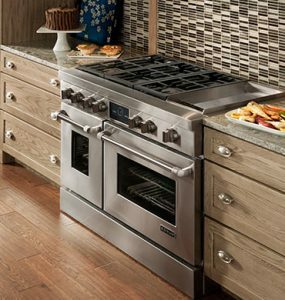 The electric and gas slide-in ranges available from this brand are simply wonderful as are its cooktops and wall ovens. The refrigerator models from the company are also appreciated by people across the world. Just like the other well-known kitchen appliance brands on this list. Even this brand has its focus on manufacturing and designing appliances that are Wi-Fi compatible and can run on apps. They have made the design and manufacture of top quality kitchen appliances a priority. While there are other kitchen appliance brands that might have got high ratings and awards in recent studies and evaluations, Bosch Benchmark and its products have always remained in the top list of preferences among customers for their esteemed ratings. This is one brands that has done specifically well in offering top quality and high performance wall ovens and cooktops. It is also known for providing top performing over-the-range microwaves. This is one company that is worth looking into if you want reliable and durable kitchen tools and gadgets for working smartly in your meal preparation area. The main strengths of the company include good warranties, useful features and affordable prices in comparison to the other brands. It is only because of the above mentioned features that Bosch Benchmark is a good choice for all those buyers who are in the look out of budget appliances and tools that perform excellently. Miele is one of the most excellent alternative kitchen appliance brands known for offering products in sleek and simple designs. Are you in the look out of an alternative company in comparison to the general suspects in the market? Do you want an alternative kitchen appliance brand that consistently works towards improving the quality of its products and gets praises for product performance and quality? If this is the case then Miele is undoubtedly the type of brand that you must have a look at. It is one company that will promise you the delivery of the best kitchen appliances but within ranges that can easily be afforded. The products from this company have amassed the top quality products from multiple best brands over the years. It is a company that is known for all its top-of-the-line products. Nevertheless, there are two significant considerations regarding Miele and they are worth knowing. The very first thing that you need to note about this kitchen appliance company is that it has its focus of designing and manufacturing products that specifically meet the requirements and the preferences of the American customers. Hence, all its products are easily compatible with American voltage and outlets. The second noteworthy point about this brand is that it is high-end when it comes to product construction. This means that all the kitchen appliances available from Miele are high-end products available at an expensive price. Since prices might be higher for Miele kitchen products, you must watch them out carefully in order to get the best deals. 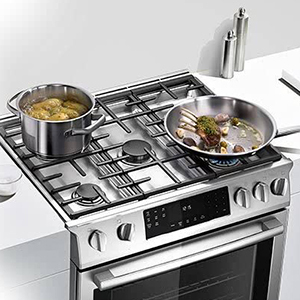 Since the year 2008, Jenn-Air is a brand that has consistently and continuously served as one of the highest-end kitchen appliance brands offering some of the best quality products. The kitchen appliances from Jenn-Air span a huge range from microwaves and front panel control ranges to in-built refrigeration and professional level gas ranges. It serves as the one and the only brand that offers downdraft cooktops and ranges. Their slide-in packages include slide-in ranges with warming drawers and convections. There are even convection microwaves available from this brand which means that you have two ovens along with a warming drawer for smart and efficient cooking. There are integrated dishwashers that this brand also deals in along with counter-depth French door style refrigerators. The kitchen appliance packages that come from Jenn-Air are the most popular sold affordable luxury packages in the United States. This is mainly because the buyers get a lot of potential to cook while admitting the fact that all Jenn-Air appliances are aesthetically pleasing. It is also important to note that all the kitchen products that come from this company are hi-tech making it a bit difficult for technically retarded individuals to have their hands on them. This is one of the first and probably the only highly affordable luxury appliance company to take on a menu-driven cooking mechanism in its wall ovens. The company has also grabbed a lot of popularity for delivering obsidian refrigerator interior in its in-built refrigerators. Its refrigerators are also available in select free-standing models. The brand has always put in the best efforts in delivering kitchen appliances that speak of great designs and advanced technology and this goes special for its refrigerators. LG is one brand that has marked its presence in different categories of kitchen and home appliances. And LG is a brand that is generally known for providing good quality electronics but the company has been successful in winning innumerable accolades for the kitchen appliance range that it deals in. The brand ranks highest in kitchen appliance ratings for dryers, washers, oven ranges, dishwashers, top-mount freezer-fridge varieties and French door style refrigerators. This is probably great many appliance options. The brand is known for performing exceptionally well in reliability, styling, ease of use, appearance and power. All hi-tech products available from LG have reports of serving the customers for years without any disturbances. The company does not make too difficult to use or too fragile products that would not work in modern kitchen spaces. One thing that you must surely note about the products that come from this brand is that they are on a bit expensive side of things. 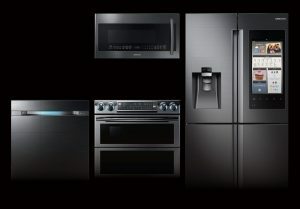 There are good reasons why Samsung is one of the top-selling kitchen appliance brands in the United States. It is a brand that is known for offering high-tech options within a range that can easily be afforded by the budget conscious buyers. The large kitchen appliances from this company are available in the latest designs and this is something that has helped Samsung in grabbing the top position in the list of luxury kitchen appliance brands. The products from Samsung also come with excellent compatibility advantages with the other devices. GE or General Electric is one of the most familiar names for kitchen appliances. The company offers a huge selection of dishwashers and refrigerators in varied price ranges. There are varied models available for the products that GE deals in and this is something that makes the company worth considering for kitchen appliance purchase. There is absolutely no need for you to spend a huge amount of money in order to get the best kitchen product deal. Just go for products available from the best kitchen appliance brands and experience ultimate luxury without paying a heavy price.